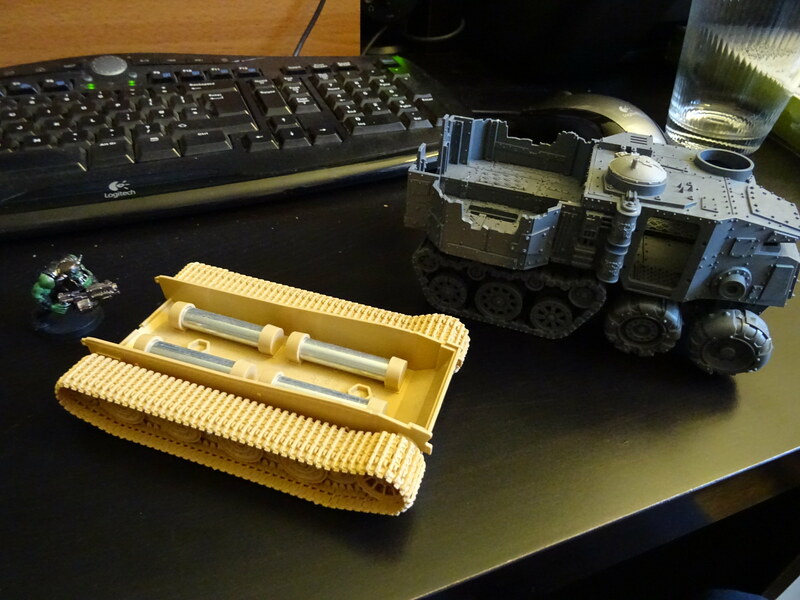 I picked up a Tiger tank model kit a few weeks back, and it has some really nice tracks. I'm feeling inspired to build it into an Orky wagon. 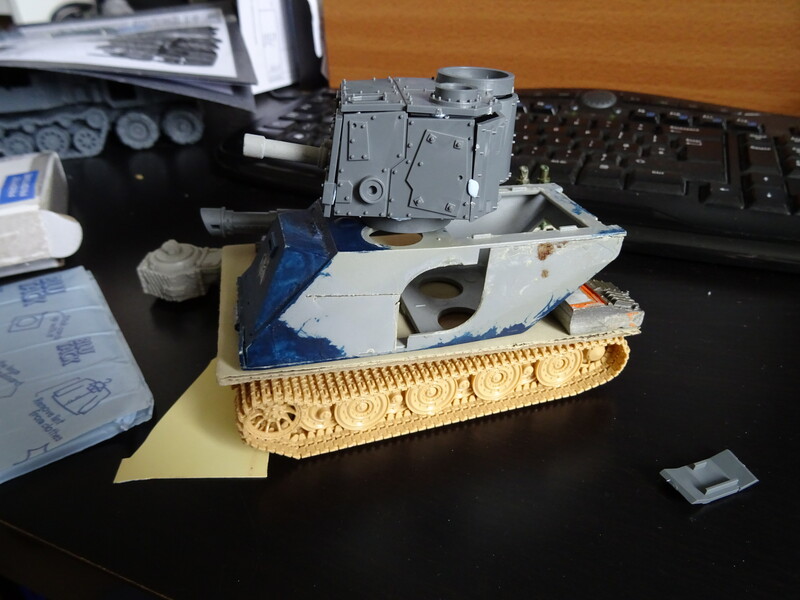 My current Plan A is to build an Orky version of the old M3 Lee tank. I always thought that the lopsided design felt very Orky; the big cannon in a sponson with another turret on top, riveted together. It feels like something slapped together in a rush, which I think is a good mix for Orks conceptually. 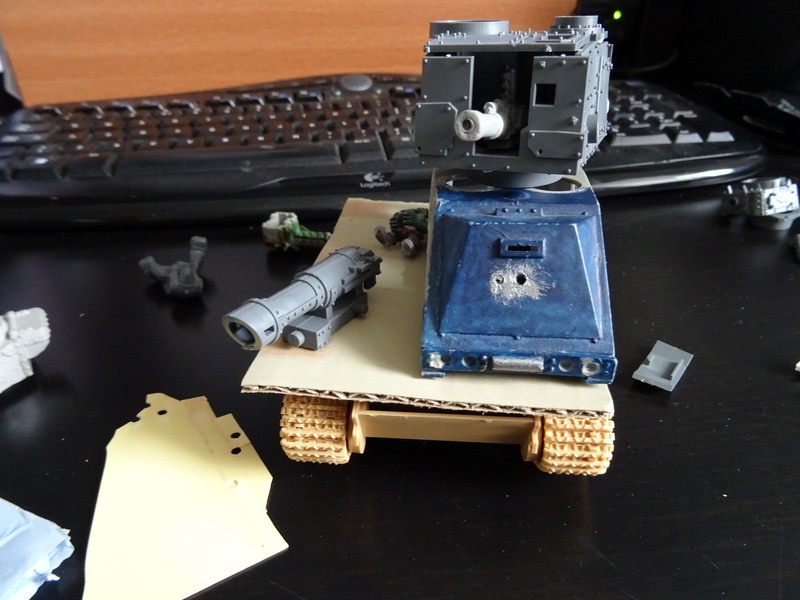 I'd go with a sponson mounted Kannon (I've got one from the Battlewagon kit going spare), and a little turret on top packing a rocket launcher or big shoota. The alternative would be to go for something a bit more open aired and multilayered- kind of like a scaled down Battlefortress design. 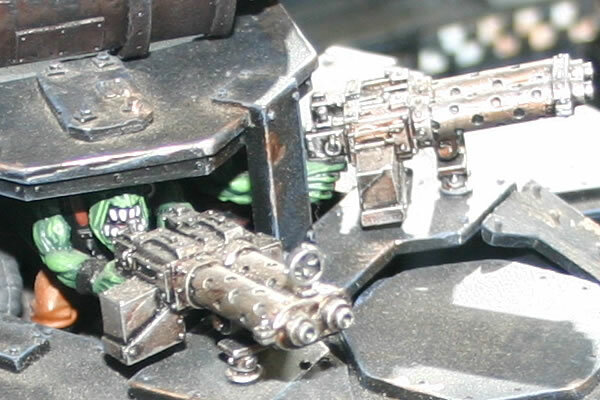 I always loved the exposed gunner pits on that model, with the enclosed roof. Maybe a top deck like the old Forgeworld Gunwagon, but with a big lower deck packing a Kannon in a casemate or sponson. Interesting looking piece of kit, gotta ask - what are those tubey bits in the bottom of the hull? Great concept, the Tiger chassis gives some Orky bulk that a M3 lacks. Downloaded a picture of a looted Lee from somewhere, and now I can't find it. "Had a look at your link to the Lee tank (could have sworn the gun was on the other side of the tank!)" Perhaps the fact that we drive on different sides of the road might have something to do with it. Those metal cylinders are just weights, to add a bit of heft to the finished model. Figured I'd leave them in, help make the finished model a little more stable! Yeah, I always thought the chunky Tiger tracks were very Orky I think I'll try to make the driver's cab side a bit more bulky than on a Lee- it's a little bit too sloping and, well, sensible. i tried something like this years ago. 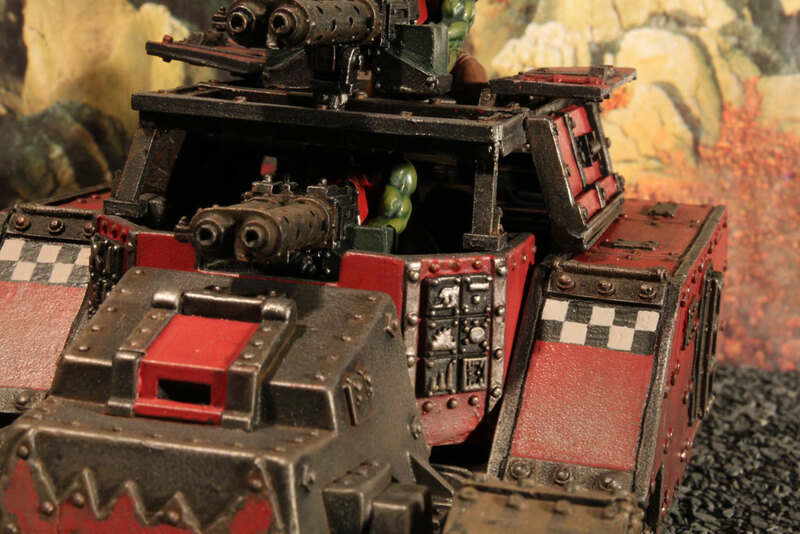 Ork vehicles should always look unstable - look at the race that created them (yeah, a bit of base weight rarely does any harm but it does seem an odd thing to put in a model tiger ). Nah, the Grant was on the same side too - probably the gun had to be loaded from the left (and tanks pretty much drive whichever side they want coz TANK ). 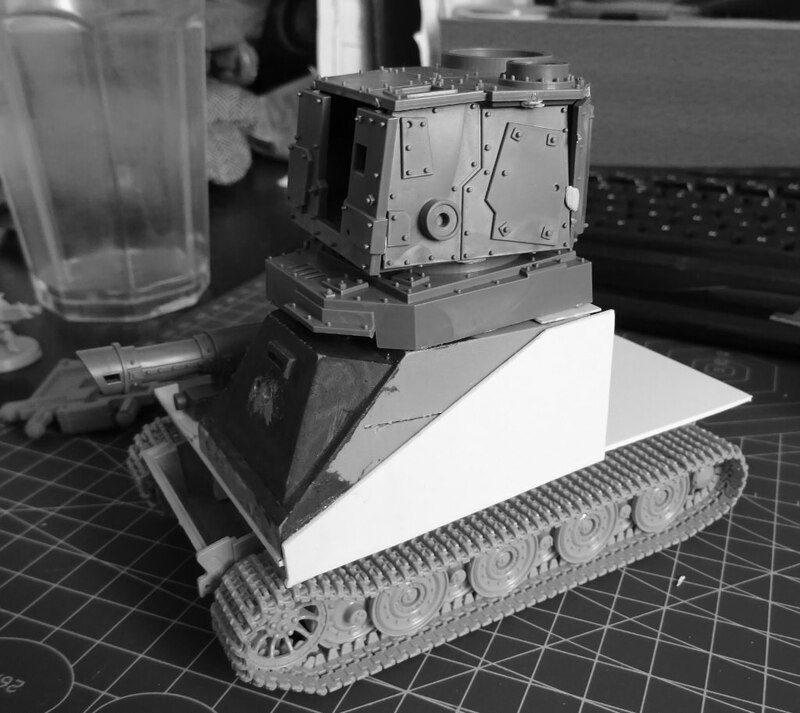 I had a Lee kit that I got as a Battlewagon donor, but I just couldn't figure out what to do about that rounded bit at the front. I wound up reversing it for a Big Trakk that I haven't really looked at since I failed to finish before the Big Mek Challenge deadline two years ago or thereabouts. Anyway, yes, apart from the rounded part I can totally see that as an Ork vehicle. Found the looted Lee image on Pinterest, under Evil Sunz Orks; <https://i.pinimg.com...b2e4a1d2121.jpg> . Hope this helps. "Nah, the Grant was on the same side too - probably the gun had to be loaded from the left " The M3 Grant/Lee was essentially a scaled up M2, on which some models had a machine gun sponson on the left. The U.S. lacked the technology to manufacture a large gun turret at the time, so a sponson mount it was. The driver was in the center, but the particulars of the 75 mm cannon probably dictated placement. No thoughts on your faulty memory ( It's hell getting old! ). Found it on Pinterest under Evil Sunz Orks; <https://i.pinimg.com...b2e4a1d2121.jpg> . Hope this helps. Wow, nice find! I love the vertically stacked style of that. like a rounded version of a killbursta without dozerblade. but with a very nice 2nd ed. attitude. "Wow, nice find! I love the vertically stacked style of that. "; "like a rounded version of a killbursta without dozerblade. but with a very nice 2nd ed. attitude. like it." I don't have an M3 Grant/Lee (have an M4), but this one was an exceptional build, so I downloaded the image. It was red too! Like you said DocNuk, "very nice 2nd ed. attitude." Lots of things to loot on this one! I hope you find something lootable as well Penelope. P.S. 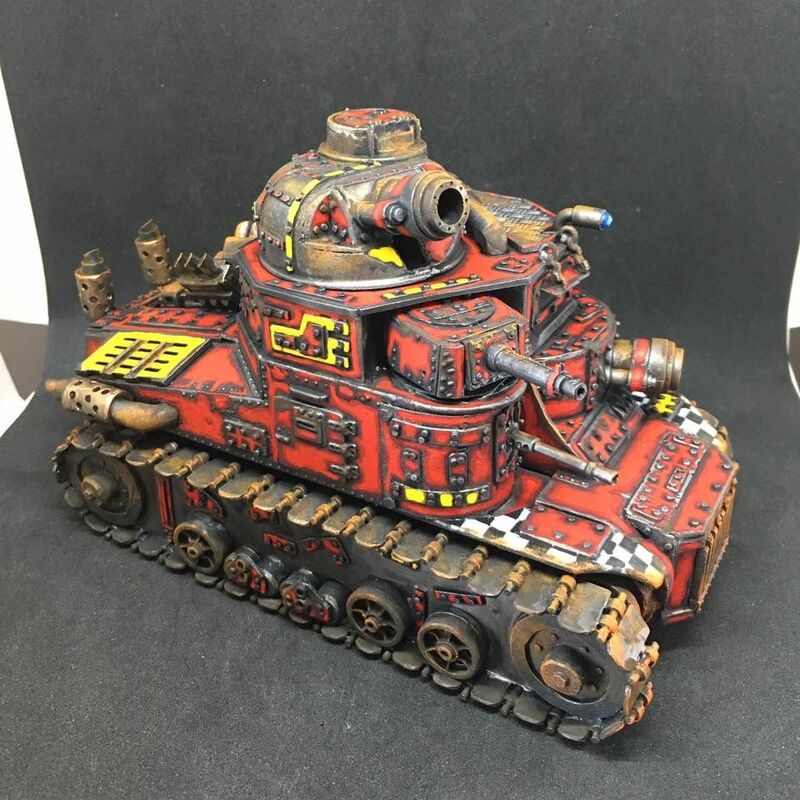 DocNuk, thanks for the images of your enlarged battlewagon. It (and Sukigod's) was the inspiration for someone in Australia, and his battlewagon inspired me to get back to building again a few years ago. I found my way here a week or two after that. I owe you a BIG Thank You! for getting me back into the hobby. The main hull kannon is obviously raided from a Battlewagon, as is the turret. The weedy kannon in the turret is actually an old Splatta Kannon which I've had lying around since, well, forever. 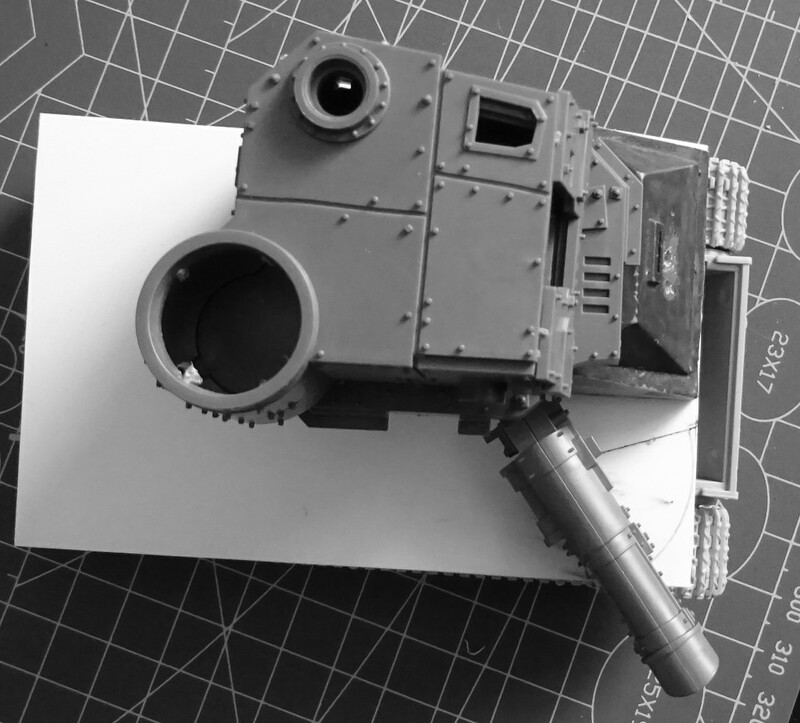 It's extremely small and weedy compared to the turret it's in, but I like that look for Orky tech- big, bulky, and kind of inefficient. The Rhino hull is just there as a placeholder right now- I needed something roughly the correct size to prop the turret on top of. But I'm actually kind of taken with the look of the old Rhino front, on the front of the tank. Maybe I'll keep it, with some Orking up. Obviously the rest of the body would get hacked away and replaced with something plasticarded and more Orky, but I'm still at the "figure out what the hell I'm doing" stage- don't want to rush to gluing things together and ruin it. 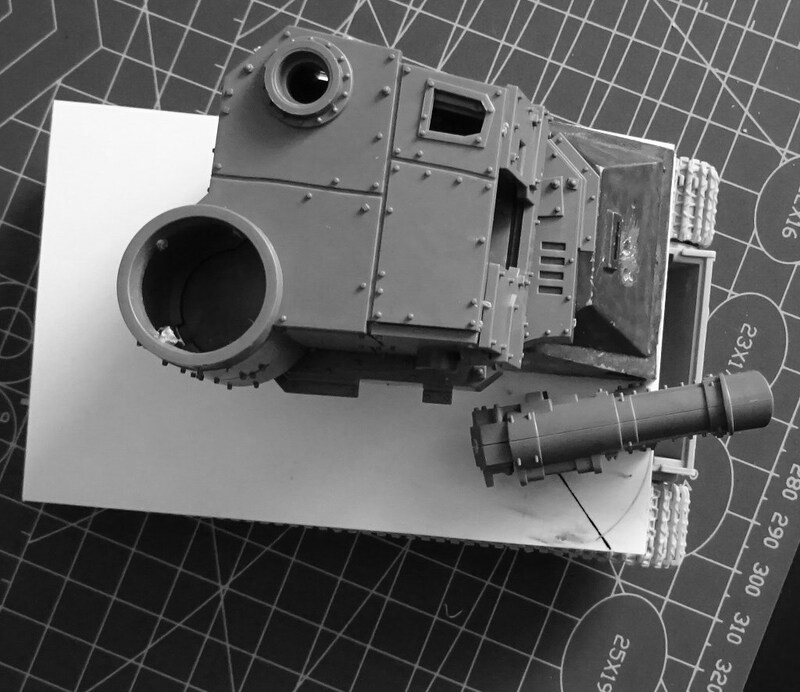 The main hull kannon will need boxing in with a hull mount, and that entire side of the tank will need building up with plasticard. Thankfully I've got plenty of doors and armor plates to detail it up. And I'll need to come up with a nice design for the engine on the back. The rhino front is perfect for this build. I like the idea of the ammo sticking through the turret roof as well. If you're worried about the Splatta Kannon looking weedy, add a couple coaxial big shootas. An old pill bottle would be a good starting point if you want a sponson mount for the hull gun. I like the layout, and can't wait for the build to start. I'm gonna add my support to the campaign to keep that rhino hull on there. It looks "right" and it's nice for the old timers who still recognise old rhino parts. The big obvious gap at the front is because I want to build some sort of front ram, and will use that space to integrate it. I've got some I-beam strips coming in the post, that will get used to build up the frame for the ram (I always find that plasticard alone looks a bit weedy for that sort of structure). Obviously the sides will need a lot of detail; I'm just getting all the frame built up first. I'm wondering if maybe the arcs might be a bit too wide, and I'm not entirely sure what style of mount I want. I could have an open "letterbox" type slot that the gun swings back and forth in, but then it can't elevate. I can use some thin plasticard to make a curved gunshield with a vertical slot in it, so that I can rotate the whole shield left and right while still elevating... but then the shield itself gets in the way, and would limit the fire arcs. Hmmm. Penelope, you want to rotate & elevate the kannon? To elevate, simply use the mounting hardware that comes with the kannon. I suggest pushing the kannon forward, to bring the pivot point closer to the shield. Doing this will give you more room to traverse the gun. Now the hard part. You will need a cylinder, pill bottle, PVC pipe, plasticard, etc. for the shield. 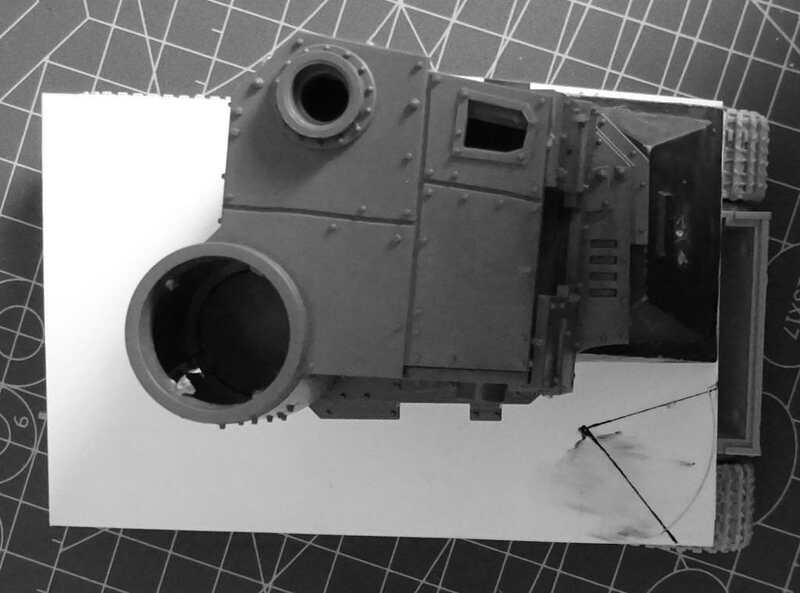 There are a couple ways to accomplish rotation: Drill a hole in the bottom of whatever you are mounting the kannon on, and the platform (the big piece of white plasticard the kannon is placed on in the pictures). Put a small bolt, a flat head nail (shortened, with the pointy end cut off), or a tack (cut the same as the nail), through the hole. Apply glue, or a nut from below the platform. Then attach the kannon. If you want a sponson, or a partial sponson (large curved shield with a top), you will need to make top and a bottom pieces for the sponson cylinder. Drill a hole in the top and the bottom pieces of the sponson. Also, drill holes in the platform, and whatever will be serving as the roof. This time you will need to run the bolt/nail/tack from above and below, into the sponson (from the outside in). Mount the kannon on the cylinder bottom piece. Badfang probably has better ideas, and will most likely explain it better than I can. Hmmm, sounds like I've been volunteered Luckily I am starting the rokkit launcha turrets for my skull'amma tomorrow and they're going to be doing much the same thing in much the same sort of place, I'll take pix as I'm doing it and you should be able to adapt them if you haven't already come up with your own way of doing it.